That graduation cap, a.k.a. mortarboard, is a hard-won prize for students at all educational levels. Our congrats to the graduate! glass personalized Christmas ornament is a lasting way to say "well done" to those who have attained this important achievement. We'll add a name to this attractive, blown glass ornament before slipping it into our black velvet bag and shipping it to you. 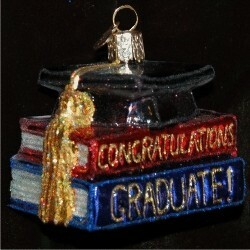 The graduation cap glass Christmas ornament lets the recipient know how proud you are of them in a tangible way. It's one of our graduation ornaments personalized for the recipient that will remind them of their accomplishment and inspire them to make the most of their education in the years to come. Gift Dec 15, 2014 Jenny S.
XMAS Gift Dec 26, 2013 Joanne N.